The case of this kind of watch is made of fine steel, partially electroplated rose gold, and the case size is 44mm, which extends the clean line of Reef Tiger Seattle watches. The design of the lug is delicate and harmonious. Its camber is ergonomically designed to ensure comfortable wearing. The Seahawk watch uses swirl marks as the dial base line, it is quite elegant. It is to wish you a successful career, love and family literally with three separate and integrated round designs. 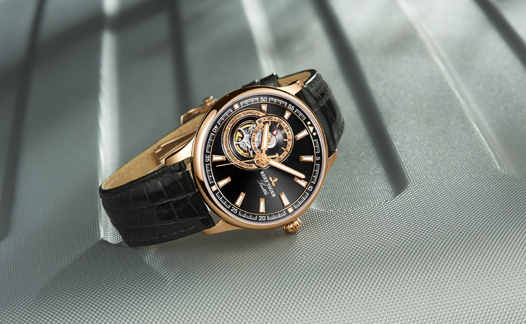 6 o’clock position with decorative gem, the Tourbillon with carved plywood is the soul of the whole watch. And the modeling 24 hour needle on the flywheel turns around with time; the design is lively and interesting. 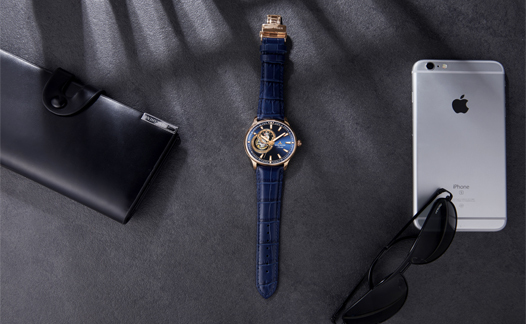 In order to locate the visual focus on the Tourbillon, the Sea hawk watch marks hours with track type time scales, and the super luminous is echoed by the Tourbillon at 9:00. The time scales shows multi-depth and multi-level visual effects on the dial. The spiral crown design is used in this watch. The design of the flattened circle crown is unique and original. The design of the crown is very decorative. The Royal crown watch matches with Reef Tiger’s unique size strap and specially designed butterfly buckle. The strap is soft and comfortable; the lines of the buckle are smooth and graceful, showing exquisite elegance and taste. The dial of Sea hawk first carved the swirl marks on the main dial, and then hollowed out 9 o’clock position. The hollow edge is smooth and exquisite. Finally, inset the time scale, distinct levels and complex process. 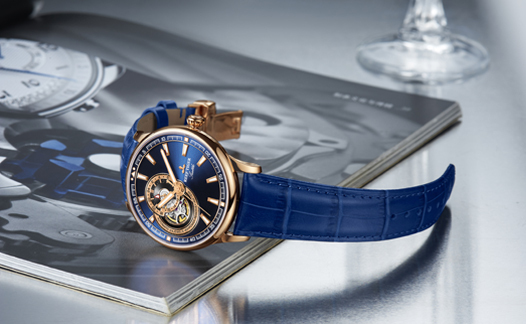 Different from the ordinary sapphire plane, Sea hawk watch uses a high technological twin bridge sapphire. The middle of the sapphire glass is the thickest part, and thinning to the edge. It is also handled by the anti-dazzle, pervious to light and clear, perfectly presents the decorated exquisite dial in sight. The technical core of the watch is that it carries the RT3900 pendulum movement. The whole flywheel is completely open, and the delicate operation posture is so eye-catching and amazing. The Royal crown rose gold watches are all adopted 10um real rose gold plating. Such a thick electroplating layer ensures the watch is able to last a long time and will never fade. Even on the crown, the tiny details, Sea hawk watch also strives for perfect. It is luxurious and glorious to use spiral crown, and all by manual polishing, more considerations of watch’s workmanship. The leather strap of Sea hawk watch also uses full hemming manufacture. To achieve a better styling effect, the micelles are filled with between the strap and the case. And the specially designed folding buckle can make the strap perfectly set and achieve the most comfortable wearing effect.